The Newport 462-XZ-M ULTRAlign Precision Integrated Crossed-Roller Bearing Linear Stage offers precise movement in both the X axis and the vertical Z axis. Made of Stainless Steel for thermal stability, and using thermally-matched hardened roller bearings, this series of stage can carry heavier loads than a ball-bearing stage, as well as being smoother in translation. 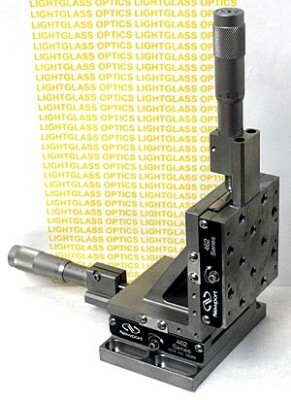 The Newport SM-25 Micrometer Actuators shown in the photo are included in the price.